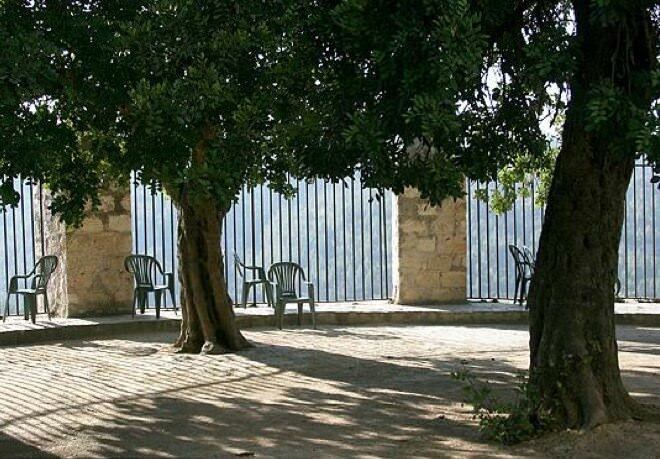 For the Christians, Ein Kerem represents the birthplace of John the Baptist, the precursor of Christianity. Yochanan (John), like Jesus, was also Jewish – his father Zechariah served as a priest in the Temple, and his mother Elisheva – Elizabeth in English, was the granddaughter of the priest Matan of the house of Aaron. According to tradition, they lived in a small village in the Judean Mountains, which is Ein kerem. Inside the impressive church stands an apse, a niche in the church where the main altar is located, facing East like in most churches. In the apse, are statues of John’s parents – Zechariah and Elizabeth. On the left you will find a number of steps leading to a small cave, known as the Crypt. Rumor has it that John was born there. There are stone engravings on the wall, among them John can be recognized by his beard, his goat clothing and his wooden stick with a snake engraved on it. For many centuries, the simple people could not read or write. The most effective solution was to draw or engrave the images of important figures from the Christian world. In this way icons were invented, a word we mainly associate today with computers. Similarly to all catholic churches, the Saint John's Church has a confessional, a baptismal fountain, and the fourteen stations of Via Dolorosa, the final path of Jesus. The stations appear on the walls in magnificent paintings. All these were donated to the Ein Kerem church by pilgrims, European royalty such as The King of Spain, also mentioned in the entrance to the church by the Spanish royal emblem, and other interested parties. Continue to the Convent of the Sisters of Zion. After ringing the gate, kind nuns will open and usher you in. As you enter, turn right into the beautiful yard. In the middle of the 19th century, Alfonso Ratisbon arrived in Jerusalem. Ratisbon, a converted Jew, after whom the Ratisbon Monastery in Rechavia neighborhood is named, as well as the Church of the Zion Sisters in the Old city, founded the Order of the Sisters of Zion, and managed to attain some land in Ein Kerem, despite the prohibition of the Turks to sell lands to “non-Muslims.” Pay attention to the trees near his house, there are 3 cedar trees, each of them a 130 years old. We shall proceed to the guest house. At its back, you can see a panoramic view of the Judean Hills to the north and to the west. You are invited to sit down on a bench or a chair and enjoy the view. If you happen to be visiting in the winter, you may notice the water running in the stream of the valley across from you, bordered by the famous Ein Kerem dam. In the rain season you can even see the water flowing down from the dam, creating a waterfall. Few meters to the South from the relaxing observation point, you will arrive at the small cemetery of the monastery, where Ratisbon is buried. Above the grave, there is a statue of Maria, and a phrase is engraved: "Oh Mary, Remember your child captured by your love." 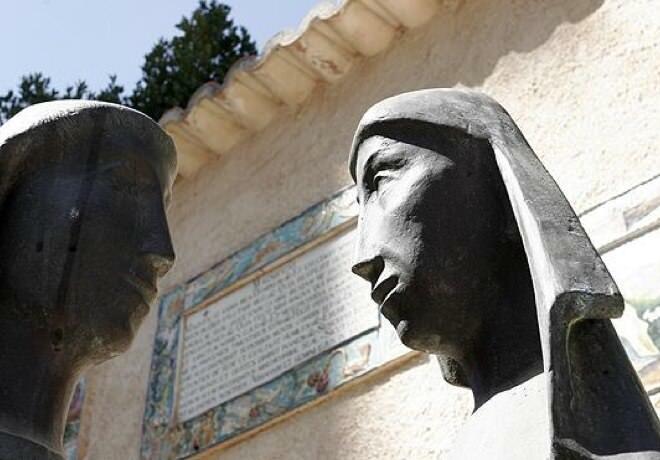 Other than Alfonso Ratisbon, the cemetery is also the burial place for nuns who lived in the monastery since its establishment in the 19th century, and even a sarcophagus from the second Temple Period found at the monastery’s territory. Pay attention to the spectacular view from the cemetery Southwards and you will see the steeple of the Church of the Visitation (which we will also visit). Above the steeple lies the dome of the Russian Church, the construction of which began in 1905 and was finished only recently, after nearly a 100 years of stasis. After leaving the Convent of the Sisters of Zion, turn right and go down South, until you have reached the road, then turn right again, towards the Ein Kerem Fountain. According to the Christian tradition, Mary (mother of Jesus) and Elizabeth (mother of John) met each other while they were both pregnant. Hence, Jesus and John were born in the same year. Go up South and climb to the impressive Church of Visitation, where there is also a great panoramic view watching over the entire area. The view is breathtaking, and allows you to see as far as the beginning of Sorek Stream, which ends at the Palmachim beach near Ashkelon. On the church wall you can see many mosaics presenting a prayer from the New Testament written in over 40 languages. With the permission of the Franciscan friars, you may go up to the upper church on the second floor and see the marvelous stone paintings. Next we will go back again to the village, to our starting point. Ein Kerem was an Arab village until the War of Independence in 1948. 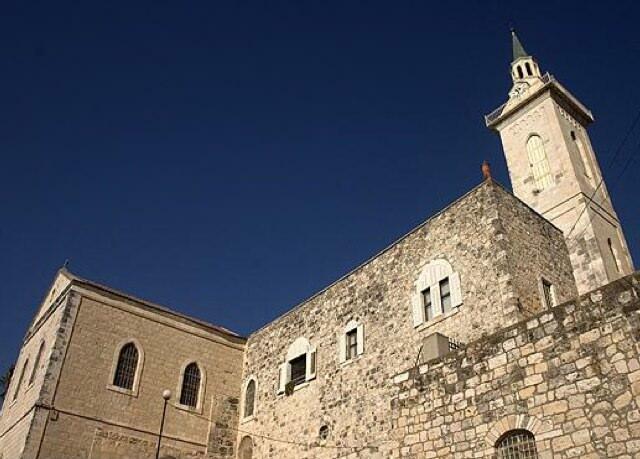 During the war it was abandoned by its Arab residents, who left in part to Jordan, others to Bethlehem area. There is an amusing urban legend told among the new Jewish residents of the village, that some of the previous residents hid sacks of gold inside the walls, and didn’t have time to take them while running away from the war. Legend or not, but in 1950, some Mr Maziano had opened a grocery store on the corner of ha-Maayan Street. He laughed at the stories of the village’s elderly who claimed that his shop is the burial place of gold treasures, belonging to Dr. Joachim, who lived there until 1948. A year after the Public Works Department started to expand the road, two bags of gold were found inside the destroyed walls. Needless to say that the owner of the house, who ran away to Jordan was devastated when he found out that his treasure was discovered, and rumor has it that that he lost his mind. A year later, Arabs, former residents of the village, had broken into the house the had left, destroying a wall, and taking the goods their family hid three years ago. And what is a tour without an authentic Jerusalem love story? In the 1930s Jerusalem was going mad over a love story that took place in the magical alleys of Ein Kerem. The lovers were a Christian Arab from the neighborhood, Jabra, and a Jewish girl from Machane Yehuda, Alegra. Needless to say that the families did not approve of the relationship. However, love took its natural course and the two eventually got married. Alegra’s father sat shiva over his daughter (a Jewish mourning custom over the dead) and Jabra could never return to his village.